This 1952 Studebaker Commander 2-Door Sedan belongs to Frank Clark of Carthage, New York. Frank relates that he found his Stude by accident when he went looking for a truck. The car was sitting in a barn in the middle of nowhere. Frank put in a battery and drove it away. That was 15 years ago. The engine has been rebuilt and both rear fenders have been replaced. Frank's Commander has a manual transmission with the overdrive option. Commander 2-Door Sedans are relatively rare. Only 7,524 Commander 2-Door Sedans were produced in 1952 which is fewer than production of the Starlight Coupe or the new for 1952 Starliner Hardtop. The above picture of this outstanding 1956 Studebaker Golden Hawk was taken at a Studebaker meet in Gettysburg, Pennsylvania some years ago. The Golden Hawk was the top of the Hawk line for 1956. It was the only Studebaker model that used a Packard engine. The attractive wire wheel covers were carried over from the 1955 Studebaker Speedster. Only 4,071 Golden Hawks were produced for the 1956 model year, so they are relatively rare birds today. The Packard engine was only used in 1956. For 1957, Hawks grew large tail fins and Golden Hawks used a supercharged Studebaker 289 cubic inch V8 in place of the Packard engine. Bill Terry sent in this picture of a 1958 Silver Hawk Coupe that he owned in the late 1970's. The two tone color scheme with the painted tail fin insert is correct for 1958. Bill's Hawk has the 289 cubic inch V8 engine. The 1958 Silver Hawk was also available with the 185 cubic inch Champion six. Changes from 1957 included 14" wheels and a round Hawk emblem at the bottom of the front grille. Only 7,294 Silver Hawk Coupes were produced for the 1958 model year. An additional 56 Silver Hawk Hardtops were made for export. This was a big drop from the 15,070 Silver Hawks produced the previous year. I bought this Lewis Galoob Studebaker Avanti for a dollar at a swap meet. It is from the "Macro Machines" series and is about the size of a Matchbox or Hot Wheels car. It is plastic with painted windows and metal axles. The round headlamps indicate that it is supposed to be a 1963 model Avanti. 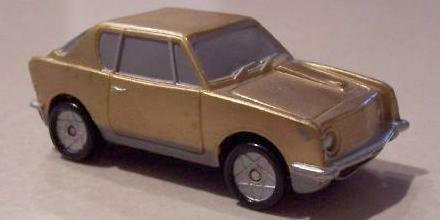 Galoob also issued an Avanti in the smaller but much better known "Micro Machines" series. To see more toy Studes, visit my Studebaker Toys Home Page.